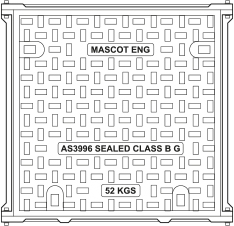 Mascot Engineering’s solid top access covers and frames are boltdown and finished with an anti-slip surface and are available in Class B, Class D and Class G loadings (as per AS3996). Ideally suited to stormwater/sewer systems as well as electrical and communications enclosures, they are available with marker plates if needed. Given the design of the frames, these covers can be made into two part, three part, trench-run and multipart systems to suit your project.